Malignant melanomas are skin cancers that can spread rapidly through your body and kill you. Each year in the United States an estimated 77,000 people will develop invasive malignant melanoma; about 47,000 in men and 30,000 in women. For many years we have been told to watch existing moles for changes that may signal a melanoma, but a new review of 38 studies covering 20,126 melanomas shows that fewer than 30 percent of melanomas are found on moles (Journal of the American Academy of Dermatology, August 29, 2017). More than 70 percent of melanomas show up on previously normal skin. They may look like a new mole or may not even be easily visible. This new information means that you should check your skin often and have any change examined immediately by a dermatologist, in addition to your yearly or more frequent regular check-up. Melanomas can also develop in the eye, where they may be detected during an eye examination. Doctors can predict whether a melanoma has already spread to other parts of the body by measuring its thickness. Those that start in moles are usually thinner and therefore have a better prognosis. You should still watch any existing moles you may have for changes, using the mnemonic "ABCDE:"
• Asymmetry: One half of the spot does not match the other half. • Border Irregularity: The most significant predictor of malignancy is an irregular border, with ragged or blurred edges. 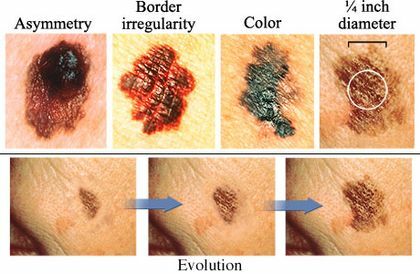 Moles that have perfect circular borders are almost never melanomas. • Color: Colors vary from darker to lighter or have shades of tan, brown, black, red, white or blue. • Evolution: It has changed in any way: increased in size, changed shape or color, or has started bleeding or become itchy, sensitive or painful. • Excessive exposure to sunlight: Sunburns and cumulative exposure to sunlight increase melanoma risk. • Family history: Some genes control when cells grow, divide into new cells, and die. Genes that help cells grow, divide, and stay alive are called oncogenes, while genes that keep cell growth in check or cause cells to die at the right time are called tumor suppressor genes. We do not yet know why increased susceptibility to melanoma appears to run in some families. • Fair, light skin, blond hair, blue or other light eye color. • A previous melanoma: You are at increased risk for another melanoma after you have had a first melanoma, or a basal or squamous cell skin cancer. • Decreased immunity: Factors that decrease immunity include chemotherapy, organ transplant, excessive sun exposure, lymphoma and diseases such as HIV/AIDs. We have no specific test for cancer. A diagnosis is made by a pathologist who looks at the cells under a microscope and describes what he sees. Cells that appear very young and immature are more likely to be cancerous. Next the pathologist looks specifically to see where the malignant cells are. Melanomas start on the surface of the skin and grow down into the skin. The further down they grow, the more likely they are to have already spread through your body. If the malignant cells are all on the top surface of the skin, they are called melanoma in situ and they may be just precancers and not even be cancer at that time. Superficial spreading melanoma is on the skin surface and you have a very high chance of being cured of that cancer before it spreads. Lentigo maligna melanoma and Acral lentiginous melanoma are other superficial melanomas that are usually cured with the first surgery. When the melanoma has grown down into the skin, it can already have spread through your body and be very dangerous. Level 2 means that it is deep, level 3 is deeper and level 4 or 5 may have spread already with a very bad prognosis. Treatment for melanomas includes wide excision and often removal of local lymph nodes, interferon, radiation, immune drugs, T-VEC vaccine, Bacille Calmette-Guerin (BCG) vaccine, interleukin-2 (IL-2) directly into the melanoma, imiquimod cream, limb perfusion, targeted therapy, immunotherapy, chemotherapy or a combination of immunotherapy and chemotherapy, and newer research protocols. In 2015, former president Jimmy Carter announced that his brain scans showed that he was clear of the melanoma cancer that had spread to his liver and brain. He took the FDA-approved immune-stimulator drug, pembrolizumab (brand name Keytruda). These drugs may be effective for treating melanomas that have already spread to other parts of the body. They stimulate your own immune system to recognize, attack and kill cancer cells.